Tasty Minstrel Games is no stranger to Kickstarter campaigns: their deck-building strategy game Eminent Domain was originally funded last year through Kickstarter and hit over 200% of its funding goal. Since then TMG has streamlined their game-production process so they know how long it will take to do things like complete artwork, manufacture the game, and get it shipped to backers. Their current drive is for the steampunk-flavored resource management game Kings of Air & Steam . You’ve got just about a month left to get in on the Kickstarter campaign, with an expected delivery date of July 2012. Read on below for my review of the game itself, but first I’ll answer the question: why should you chip in for a copy now? Basically for $45 you’ll get a copy of the game (including free shipping in the US). That’s about 25% less than their expected retail price once the game is produced and arrives in stores. You can even find some friends to chip in together, and get multiple copies at even deeper discounts. A couple more things TMG is doing for their Kickstarters: Kickstarter copies will be released at least a month before any others show up, including GenCon. The game will not be discounted anywhere online until at least June 2013, so you don’t have to worry that it’ll go on sale a month after you get yours. The biggest benefit, though, is that as TMG hits specific funding goals, the game will get better and better. Having the extra capital up front will allow them to add additional teams, use molded plastic airships and custom plastic crates (instead of generic cubes). If they hit $80,000, they’ll even have custom airships per team rather than one common airship type that everyone uses. As they put it, “as you spread the word about this fabulous game, yours will be even cooler.” There may even be some “bling” that is exclusive for Kickstarters only — but it just depends on the goal. Right now, they’ve already hit their minimum funding goal, so the game is guaranteed to be produced; it’s just a question of how many extras they can throw in. Ok, on to the game itself! Overview: Kings of Air & Steam is a combination of different types of games: there’s a bit of resource management, goods delivery, and simultaneous action selection. There’s also some interesting economics effects which determine the price of goods. It’s set in an alternate America where steamships rule the skies — but they’re a bit dangerous so they’re not allowed in cities. Combined with the rail system, though, airships can pick up goods from factories, drop them off at train depots, which then deliver goods to the cities. My “gameplay” explanation below is fairly detailed, but if you just want the summary of what I liked and didn’t like, jump to the “conclusion” section below. Rating: Excellent mechanics and great gameplay; I’m excited to see the final artwork and components on this one. Who Will Like It? Gamers who like Euro-style games, with a good bit of economics and resource management — but there’s also a bit of cutthroat competition that you don’t necessarily see in Eurogames. You can get an idea of the background story on the Kickstarter page. The prototype just has a one-paragraph “setting” explaining the story, but you don’t get all the steampunk flavor from the test copy, which doesn’t have final artwork and the custom roles that give each player different abilities. 6 double-sided player boards, showing some player aids, airship and train capacity, and space for four movement cards. The back of the cards will have the custom airship characters, but these are still under development and weren’t in the version I tested. The quality of the components will depend on the results of the Kickstarter campaign. However, the design of the game board is clever, with different hexes used for a 2, 3-4, or 5-6 player game. It’s a bit like Small World , in that the size of the board is such that the number of players will be competing for resources and space. The boards show a number of factories, plus a number of interconnected cities with railways between them. At the start of the game, each factory is seeded with one cube of its color. The market board will show that each cube is worth $4, though this will change in the game. Each player will get a chance to place one depot on a rail line, and their airship starts on the depot. Each player starts with $12. The game plays in 6 rounds, and then there is one more final shipping phase. At the end, the player with the most money wins. Draw 3 demand tiles and put them on the market board. For each tile drawn, move that color’s cube up one space on the price chart. Plan airship movement – each player chooses 4 movement cards and places them face-down on their player boards. Movement and actions – each player moves their airship according to the cards played and takes one action. This is repeated for each of the four cards. Upkeep: pay $1 per cube in your airship and depots, and collect your airship movement cards and put them back in your hand. Each factory gains a cube of its color. For each demand tile on the market board, add an additional cube to each factory of that color. Place the used demand tiles face down next to the board. Move the round marker up one space. The airship movement cards range from 0 (stay still) to 7 spaces. In addition, some of the movement cards have a number of diamonds on them. In each round, you may only play the number of diamonds according to your airship’s current level: if you play a card that puts you over your current diamond level, then you do not get to move. The cards also have letters A to G on them, and this determines the player order for each round of movement. In general, the fewer spaces you move, the sooner you will get to move. Airships can fly through cities but cannot land on them. At the end or beginning of your movement, you may load or unload goods for free. Goods can be loaded or unloaded at any factory (not common, unless you picked up stuff you need to dump) or at one of your own depots. The capacity of your airship hold is indicated on your player board — you can upgrade this to hold as many as 5 cubes at a time. Shipping goods is the primary way you make money in the game. You can ship as many cubes as you want of a single color from one depot — you can either ship it down the line to another depot, or into the appropriately-colored city. The better your train, the more “links” you can ship across in one turn. You can’t ship across any railway that doesn’t have a depot on it, but you can ship through another player’s depot by paying them $1 per cube. Once goods arrive in the city, you get paid according to the current price chart. The other key to shipping, however, is that there must be enough demand for the goods. All of the cities start off with a demand of 5; once five goods have been shipped there, you take a demand tile from the used pile, and place it on top of the city. This effectively gives 3 more demand for a randomly-selected color. Once those three are met, the demand tile is flipped over and that city no longer accepts any more goods. 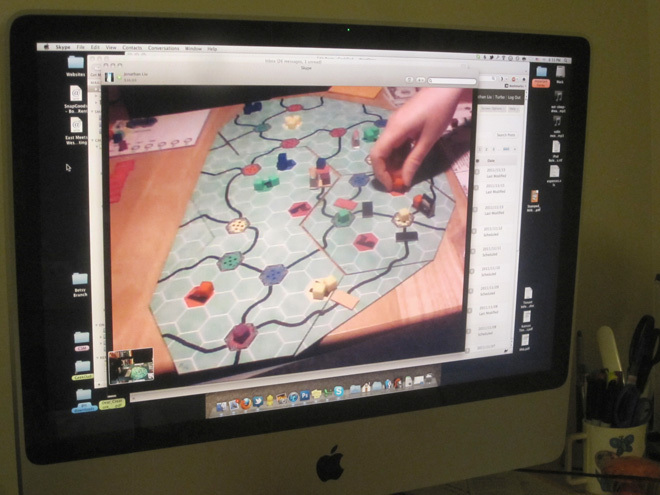 One playtesting session was conducted over Skype with GeekMom Cathe Post and her husband Tim. Kings of Air & Steam has a lot of different mechanics at work. The simultaneous card selection reminds me a bit of Wings of War , a card-based dogfight game. You’re choosing a series of four movements and planning out your route and where you’ll be picking up and dropping off goods, but you have to contend with the fact that another player might reach the factory before you and take the goods. But by then, you’ve already chosen a couple other movement cards after that, so being able to make readjustments quickly is crucial. Although at first glance it can seem a bit daunting to have all these choices for actions, you pretty quickly pick up what needs to happen. You’ll need to build depots in order to ship goods to the city that wants them, and you’ll need to upgrade your train and airship to get places faster — particularly when demand in the cities nearest you runs out and you have to travel farther afield to reach desired goods and demand. A lot of the game comes in the planning, figuring out what you’re going to do four moves at a time, and then seeing if anything interrupts your plans in the middle of those moves. The fact that you can use another player’s depot is also pretty interesting — it extends your reach (especially if your train is upgraded) without having to build depots, but you have to consider whether you’re shipping enough goods to make it worth paying another player $1 per cube. If there are already three depots on a particular railway, though, you may not have a choice at all. I do like that there are ways to work around obstacles: if you don’t have a depot but you’ve upgraded your airship, you can use some of the higher-movement cards and just fly the goods closer to the city yourself. If your airship is still slower, you can invest in depots and the train to ship things farther. Also, keeping an eye on the demand and price charts is important, because it might be worth taking more time to get to the valuable goods rather than shipping the cheap ones quickly. One other thing I’ve noticed is that your initial placement of your depot and airship is an important piece of the strategy, too. If you can find a spot that gets you near a factory and the cities that want that good, then you’ll have an easier time shipping a few things right away — but you need to have plans in place for where to go once demand is met, or you’ll be stuck in an area where nobody is buying anything and waste precious turns traveling across the board. When I’ve played, the goods didn’t vary in price too much — usually all of the cubes were within $1 of each other — but if by chance one color pulls ahead in price, things can get pretty intense as people are racing to pick up the goods before the other players. Since the lower-movement cards get to go before the higher-movement cards, predicting where your opponents will be is another important piece of the strategy. Overall, I’ve really enjoyed the game. The rules take a while to read through, but they’re fairly straightforward and I don’t think we ran into too many issues that weren’t covered in the rulebook. Again, I played with a rough prototype that didn’t have fancy artwork or polished components, but the mechanics and gameplay were engaging and it’s definitely one I can see myself getting out again, particularly with fans of games like Settlers of Catan and Puerto Rico . The modular board makes it a different game each time you play, and the additional character abilities will be interesting to see once they’re ready. If you’re in the market for a Euro-style resource-management game with a steampunk story and excellent mechanics, head over to Kickstarter to reserve your copy now, and then tell all your friends to kick in so you can get really cool components, too! Wired: A great blend of different game mechanics make for a terrific experience. Tired: Not recommended for players who can’t make up their minds or think on their feet — the game can drag a bit if players take too long to make decisions. Disclosure: GeekDad received a prototype copy of the game for review purposes.